SCVHistory.com | Mojave Desert | Death Valley National Park: Protected for the Future | By Linda Castro, 2016. SCVNews.com | March 17, 2016. There has been a lot of news coverage lately about the "super bloom" occurring in Death Valley National Park. People are flocking to the park to see and photograph the spring wildflowers. More than likely, many of these people do not know about the people primarily responsible for protecting that area for future generations to enjoy. Death Valley was purportedly named by a group of pioneers lost there in the winter of 1849-1850, enduring a two-month ordeal of "hunger and thirst and an awful silence." Even though only one member of the group died there, all assumed the valley would be their grave. 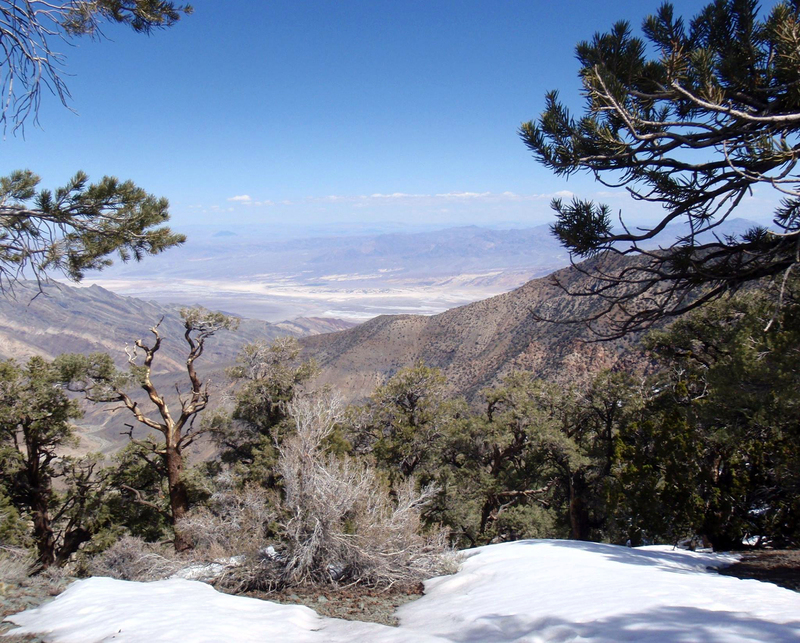 When they were rescued, as they climbed out of the valley over the Panamint Mountains, one of the men turned back and said, "Goodbye, Death Valley." That name, and the story of the lost '49ers, have become part of our Western history. On Feb. 11, 1933, in one of his last official acts, Republican President Herbert Hoover used his authority under the American Antiquities Act of 1906 to designate the Death Valley area a National Monument. With the Act, Congress gave the president the authority to declare as national monuments any historic landmarks, historic and prehistoric structures, and other objects of historic or scientific interest on public lands. With the stroke of a pen, Hoover not only authorized the protection of about 2 million acres of "scenic, scientific and educational interest" in southeastern California, but he also helped to transform one of the least habitable spots into a tourist destination. Images courtesy of the writer | Click to enlarge. Death Valley National Monument's designation came at a time when Americans were discovering the romance of the desert. Land previously considered devoid of life was being celebrated for its beauty; places once feared for their harshness were being admired for their uniqueness. From early attempts to build a California Desert Plan in the 1970s-1980s to the first version of the California Desert Protection Act introduced by Sen. Alan Cranston in 1986 to new versions by Cranston and then by Sen. Dianne Feinstein from 1987 to 1993, to the final victory by Feinstein in 1994, the efforts of many to protect Death Valley became an ongoing saga. In October 1994, Congress passed and President Bill Clinton signed Feinstein's California Desert Protection Act, which proposed, among other things, to establish Death Valley National Park. The act abolished Death Valley National Monument and incorporated its lands into a new Death Valley National Park administered as part of the National Park System. The act created the largest national park in the lower 48 states, with more than 3.3 million acres. What would have happened to the Death Valley area if Hoover had not designated it a national monument and Feinstein had not pushed for Congress to designate it a national park? Would the area now be filled with solar panels, open-pit and strip mining operations, hotels and casinos? Thankfully, we will never know.